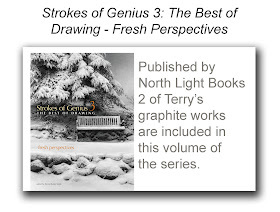 The first work off the drawing board for this new year. It's earmarked for an upcoming spring show. 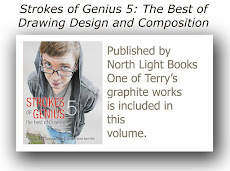 The image size is 4" x 13". With today's installment, I'll conclude this exploration that began as a simple response to a question I had posed to myself about how artists in years past may have zeroed in on bridges and bridge structure as a subject for a painting. 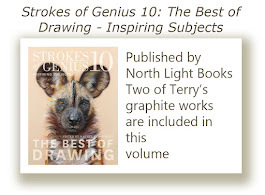 I've come across many fine and quite inspiring works as I've traveled around the Internet and picked out some of my favorite works to spotlight these last few days from dozens and dozens of paintings, some of which I was familiar with before, but many of which were fresh and new to me. In this first trio of early 20th Century American works seen above, figure 59 is by John Sloan, one of the founders of the so-called AshcanSchool whose artist cadre portrayed scenes of daily life, not dissimilar to what the Impressionists had done some forty to fifty years earlier. In Wet Night on the Bowery, Sloan brushed a moody work where the strong, dark triangular thrust of the elevated structure really dominates the composition and drives the viewer's eye into the work. A similar compositional structure and feel is seen in figure 60, a work by Johann Berthelsen, who was also known for his iconic paintings of New York City and its environs. In his painting of one of the East River bridges of Manhattan, the under bridge scene has great strength, accomplished by the severe thrust of the bridge as in the Sloan work, drawing the viewer into and through the work. The third work (figure 61), Bridge - Blackwell's Island by George Bellows another of the Ashcan School artists, takes a similar under bridge view to emphasize the strength of the structure and to act as the key to bring a viewer into the work. I like the "husky" quality of all three of these works, very masculine in feel and very emotive of the character and strength of the bridges and the city that hosted them. Morning on the River (figure 62), by Norwegian-American Jonas Lie, is the first of the next trio of works seen below. In it, the Brooklyn Bridge holds sway once again and its sharp, angular directive brings the viewer right into the heart of the painting. Queensboro Bridge by Edward Hopper (figure 63) echoes the composition of Lie's work and yet again, acts as the spark point to bring the viewer into the work and move the eye throughout. The final work by Britain's Sir Cedric Morris, Les Ponts de Ceret (figure 64), reconnects both sides of the Atlantic during the early decades of the 20th Century once again through his straight-on, very direct portrait of the two bridges. 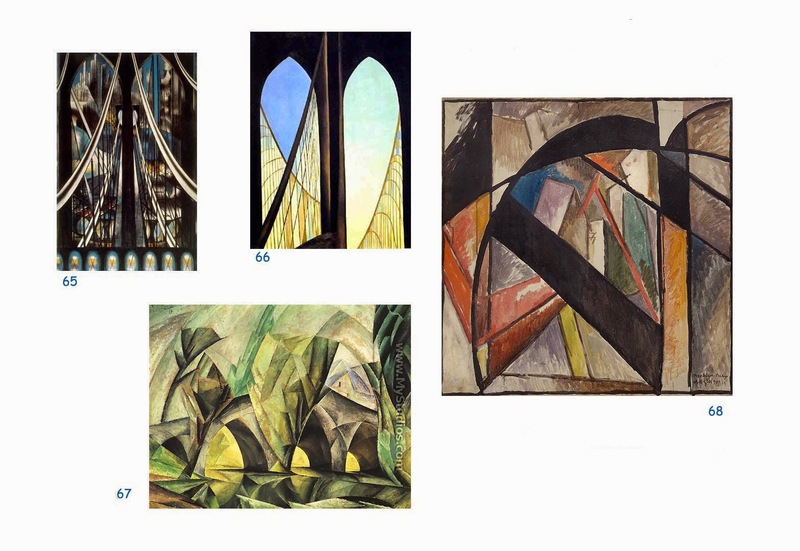 Before a few closing words, this last quartet of works, above, with bridges as a theme represent how more expressionist artists chose to feature atmospheric renderings of bridge structure. Seen in figure 65 is one of the numerous paintings of the Brooklyn Bridge that Joseph Stella brushed during the first half of the 20th Century. 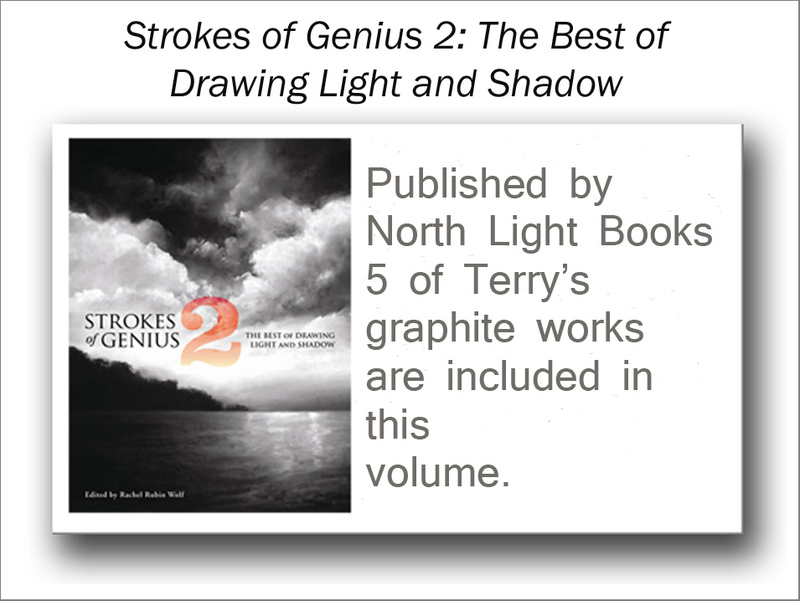 Known for his focus on industrial American imagery, he painted the bridge again and again, and as quoted from a label card on one of his other Brooklyn Bridge works in the collection of the Whitney Museum in New York, "In the engineering marvel of the Brooklyn Bridge, which he first depicted in 1918 and returned to throughout his career, he found a contemporary technological monument that embodied the modern human spirit." Georgia O'Keeffe's Brooklyn Bridge (figure 66), considered to be her farewell to New York City as one of the last paintings done before her permanent move to New Mexico at the midpoint of the 20th Century, focused on the typically pared-down, essential aspects of the subjects she chose to spotlight, in this case the towers of the iconic bridge. Lyonel Feininger, perhaps one of the most well known exponents of the Expressionist movement, featured bridge anatomy in his 1913 canvas seen in figure 67, and in figure 68, Frenchman Albert Gleizes, expressed his vision of the Brooklyn Bridge through bold brush strokes and geometric forms reminiscent of Picasso's work and that of the other Cubists. 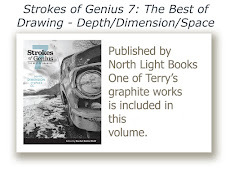 It's been an interesting journey for me as an artist, going back into the history of several hundred years of art, looking for examples of how others have come to express their having been inspired to include bridges in their work. 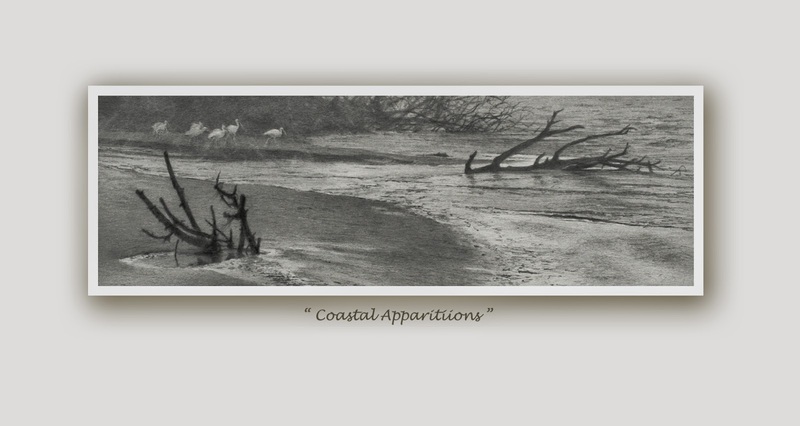 As one who finds great inspiration in the structural aspects of bridges and their integration into their surrounding landscape as possible subjects for my own work, it's been a rewarding journey as well in that it has helped to rekindle the desire to compose ideas around that central theme once again. 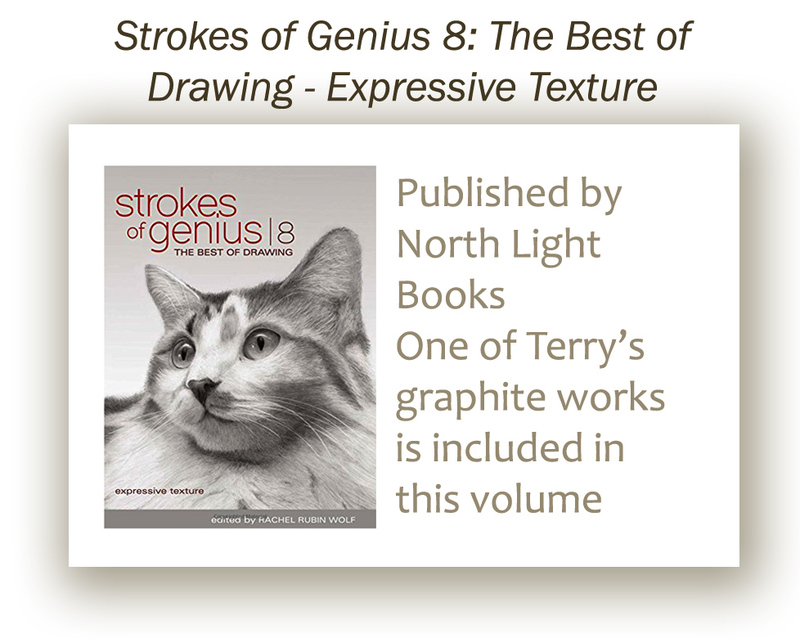 I've already been looking through much of the reference material gathered all those years ago and have begun to see possibilities for new works. In going back and looking over all the works that I've chosen to spotlight here, it has been interesting too, to see how each of the artists represented chose to approach the inclusion of a bridge or part of a bridge or its position within the landscape in their particular paintings; did the bridge become the major element, did it act as a stage set for other elements to take the spotlight, did it act as a directive to help bring a viewer into a work, did it take on an importance beyond its mere presence in the work, did it represent a pure portrait of the structure? 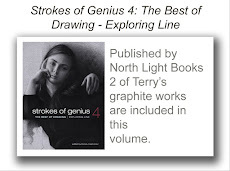 In the end, the works shown here embodied all of those possible compositional ideas, giving each artist their own way of engaging that subject matter into their work and allowing for the sort of creative exploration that inspires, gratifies, and challenges. Today's installment, the next to last of this essay, will move to a focus on works produced on this side of the Atlantic during the 20th Century by American artists. But, before we head to Brooklyn, New York, I want to briefly touch upon works of an Oriental flavor whose compositions focus upon bridges as a central theme. In the three images seen above, the central and right hand works represent just two of the vast output of Utagawa Hiroshige, considered the last great master of Ukiyo-e woodblock printing. Working primarily in the first half of the 19th Century, Hiroshige produced Bikuni Bridge in Snow (figure 49) and Fireworks at Ryogoku Bridge (figure 50) at the height of his creative talents. 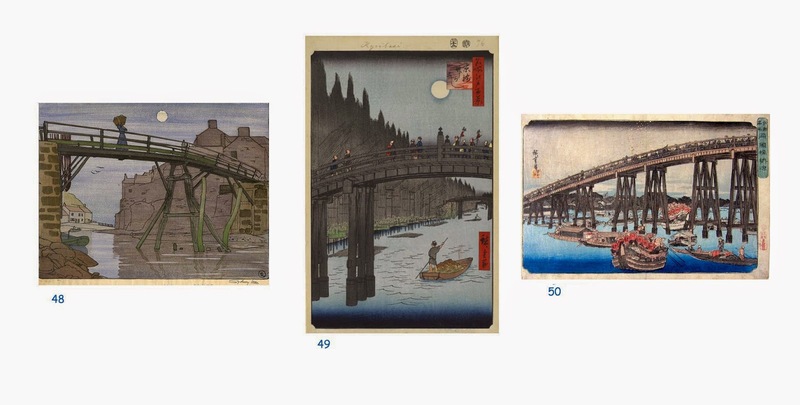 Both works focus on the activities on and surrounding bridges in the typical straight forward Japanese woodblock style, but certainly call to mind several other compositional designs mentioned and illustrated in previous installments, for example that of Whistler (Nocturne in Blue and Gold) in the very first posting and Pissarro's Old Chelsea Bridge. The third work of this trio (figure 48) also encompasses much of the character of Hiroshige's prints and is a wood engraving from the British artist, Sydney Lee, done in the first years of the 20th Century. The Bridge - Staithes really does cast a very Oriental flare through simple forms, large blocks of color and simplicity of line while placing major focus on the bridge as in the two Hiroshige works. 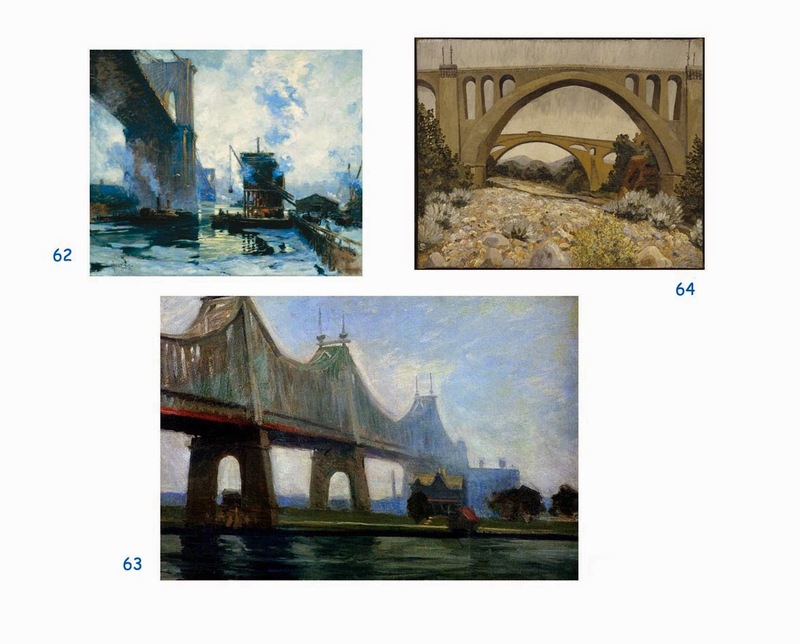 And now it is time to travel to Brooklyn during the first decades of the 20th Century with this grouping, below, of four portraits of the bridge, the first (figure 51) by Childe Hassam is Brooklyn Bridge in Winter. Just as Monet chose to feature a myriad of works based upon the bridges of the Thames and later those along the Seine in France, quite a few early 20th Century American artists focused upon the structure and form of the Brooklyn Bridge as a subject of choice. 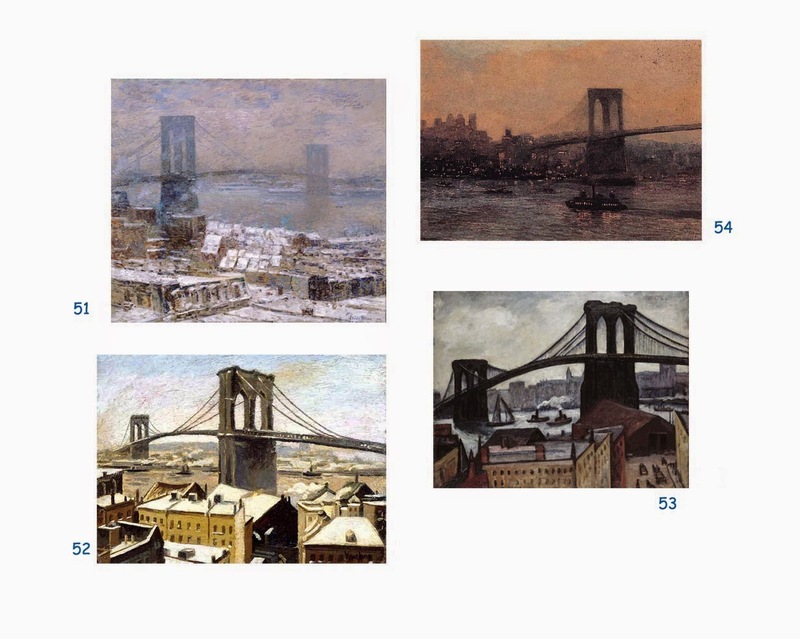 Max Kuehne in his version of the Brooklyn Bridge in Winter (figure 52) also chose a roof-top view of the entire expanse of the bridge, as did Samuel Halpert (figure 53) from what appears to be almost the exact same spot and angle of view. 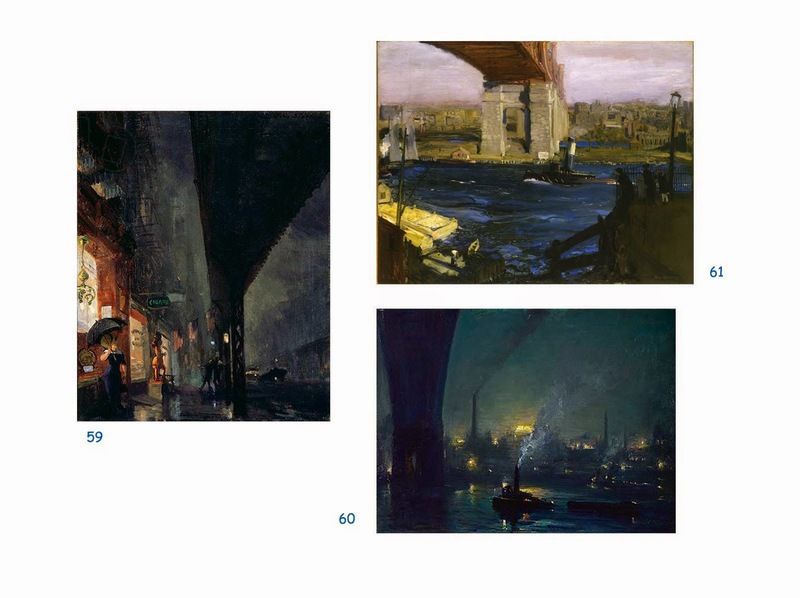 Edward Willis Redfield's more atmospheric and subtler rendering of the bridge in figure 54 completes this quartet of portraits of the iconic structure. 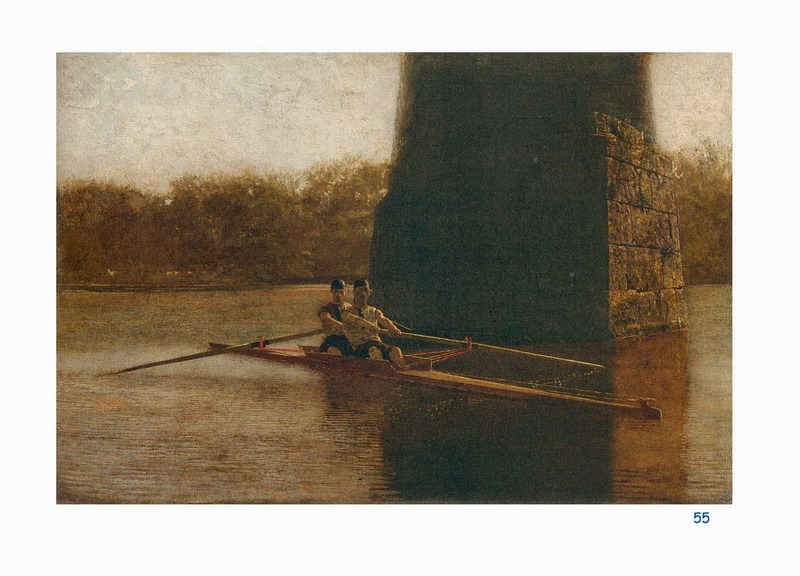 Stepping back in time, just briefly, from the time frame of the works mentioned above, no treatment of art works with a bridge as subject or theme could pass without mention of Thomas Eakins and his marvelous several works of rowers on the river in Philadelphia during the mid 1870s. 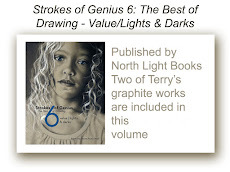 This work below, The Pair-Oared Shell (figure 55) is perhaps one of two of his best known renderings on the subject. Of course the rowers are a focal point of the work but the mass and weight and importance given to the bridge support is what really gives the work a more distinct character; in my estimation, a very gutsy compositional design. 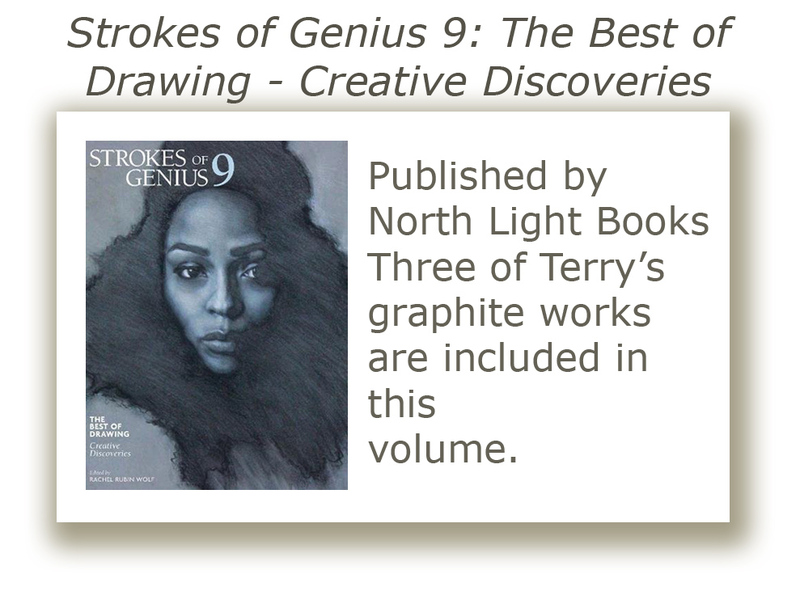 The final trio of works for today's installment appear below. Emile Gruppe, more well known for his New England land and seascapes, did spend some time in Europe and his Paris, Eiffel Tower is seen in figure 56 below. Many have compared some of his painting style to that of Monet and I can see that reflection in this work. Figure 57, The Red Bridge painted by Julian Alden Weir at the very end of the 19th Century, has a similar atmospheric quality to the brush work in Gruppe's painting and like several other works already discussed in previous days, the bridge in this work melds into the other elements of the composition because of the subtle qualities of the palette used but holds just enough strength through the intricacies of the structure and its more vivid color to become the focus of the work. 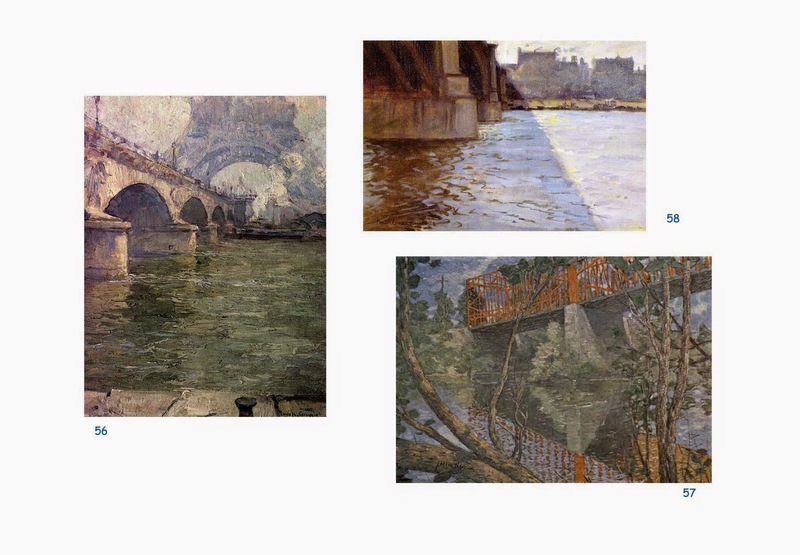 Frederick Oakes Sylvester's The Shadow of the Bridge (figure 58) rounds out the trio and calls to mind the compositional view and design of many of the Impressionist works noted earlier with its stark angle and viewpoint; a design concept I frequently find appealing as I consider a new composition myself.